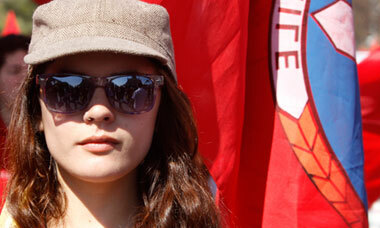 Camila Vallejo is not a typical Communist. Young, educated, fashionably unfashionable and middle-class, Vallejo is a Chilean Communist who likes to tweet several times a day. 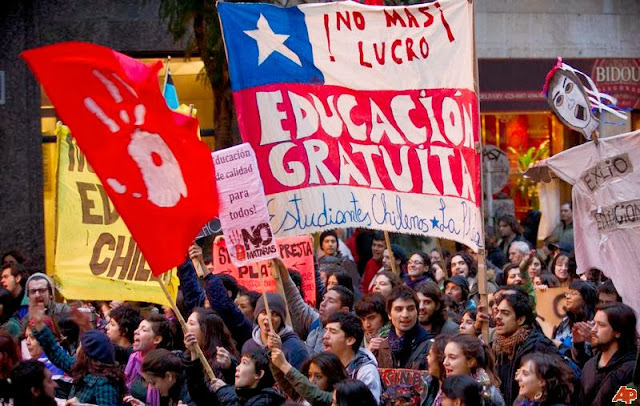 In 2011, Vallejo made headlines in this part of the world when she led tens of thousands of angry students demanding free and better public education in the wealthiest country in Latin America, whose incumbent president is a billionaire businessman. On Sunday, Vallejo was elected to Chilean Congress as the country voted to elect a new president, deputies and senators. Three other former student leaders, running on Communist Party tickets or as independents, also got elected. “We're going to celebrate our triumph on the streets of La Florida,” Vallejo said on Twitter, referring to a district in Santiago, the capital city from where she got elected. In 2011, Vallejo and her comrades had rocked the streets of Santiago with so much force that it shook the government of Sebastián Piñera, and set the tone for the presidential election. On Sunday, the impact of those raging demonstrations became clear. Running on the promise of taxing the rich and providing free education and health to everyone, Michelle Bachelet emerged winner in the first round. With the billionaire president pushing for more free-market economy since he came to power in 2010 and the income inequality rising across the country, the message from the Chilean street was clear: reform or perish. People demanded more public spending and less privileges for the rich. Bachelet and other politicians got the message coming from the street. While Bachelet got 47 per cent votes on Sunday, two other candidates – more leftist than her – got 10 per cent votes each. In total, the left managed around 70 pe rcent of the votes in the wealthiest country in entire Latin America. Similar messages are emerging from the streets – and ballot boxes – of other wealthy countries. Last week, in the Seattle City Council election, Kshama Sawant, the founder of Socialist Alternative, defeated the Democratic Party’s Richard Conlin. Asking the voters to look beyond the “two parties of big business”, Sawant pushed a $15 dollar an hour minimum wage for all workers in Seattle and promised to tax big corporations. In this battle between a Socialist and big corporations, which were all bankrolling the Democratic and Republican candidate, the people of Seattle sided with the candidate who promised more public spending, better wages, tax on the rich and less income inequality. Well, Seattle has always been a different kind of American city – liberal and alternative. But even New York, the Big Apple of global capitalism and home of Wall Street sharks and robber barons, is turning its back on big corporations. In the recently held mayoral election, more than 73 percent of New Yorkers voted for Bill de Blasio, an unabashedly left-wing politician of the Democratic Party. After more than a decade of rule by a Michael Bloomberg, a billionaire mayor who made life richer and better for the rich and privileged, the city of New York has finally revolted. While the Republican Party put another Wall Street banker as their candidate, De Blasio ran on a promise that he’d check the city’s massive wealth gap, raise taxes on the rich to fund universal pre-Kindergarten and expanded after-school programmes and keep open public hospitals. It will be too much to expect De Blasio to turn New York into a leftist utopia but he has taken the city politics in a new direction, away from the Wall Street manipulations. The focus is again on people and public services, and not on profits and privileges of the rich. Since the financial crisis of 2008, when the big banks and corporations were bailed out by the Obama administrations as they were “too big to fail” even as ordinary Americans lost their jobs, houses, social security and pensions, people have developed a deep mistrust of the Wall Street and its predatory capitalism culture. Thanks to the Occupy movements in US and Europe and the “1 percent versus 99 percent” slogan, people are looking at socialism with fresh eyes. Just like the Soviet-style socialism, which failed miserably and now lies in disrepute, the American-style capitalism too has run its course. It’s on life-support system. Now, the old capitalism versus socialism debate has no meaning. Now, people want governments and economic system that put citizen, and not corporations, at the core of their beliefs and policies. Climate, community, social security, income equality and justice are the buzzwords of the new left groups mushrooming across the world. On Sunday, as she prepared for the next round of presidential election in Chile, Bachelet articulated the desire of her people in one sentence. “Chileans voted for a tax reform that allows us to undertake an enormous transformation of our education system, to improve public health services, our pension system and our social policies,” she told her supporters. In June and July, when hundreds of thousands of people came out on the streets of Brazil, they had just one demand: better education, healthcare, transport and wages. Contrary to the market propaganda that people want private services, citizens all over the world, especially in the developing and emerging countries, are now demanding more spending on public services. And in several European countries, where well-established social welfare programmes are being dismantled under pressure from big banks and corporations, there is a sudden rise in the popularity of right-wings parties. But in the Americas, especially in the South, the left is getting stronger. It’s gaining ground because it has really empowered the poor and the marginalized. Now, the North Americans, millions of whom are trapped in poverty or staring at it, are willing to take a left turn. While the corporate media in US will be happy if American politics remains a dog-and- pony show between the “two parties of big business”, the politician who is really gaining ground and popularity in the country is Elizabeth Warren. A senator from Massachusetts, she is a nightmare for the Wall Street merchants. In her speeches, she exposes the big banks and corporations. The Wall Street crash cost the US economy $14 trillion, she said in a recent speech, but its top institutions are 30% larger than before, own half the country's bank assets and are in receipt of an implicit taxpayer subsidy of $83 billion a year because they are deemed too big to fail (by Obama). “We have got to get back to running this country for American families, not for its largest financial institutions,” said Warren, in a speech in front of union leaders in September. By the time Warren finished her speech, the union leaders were standing on their chairs. If recent mayoral elections in Boston and New York – both won by leftwing candidates with similar messages about economic inequality – are an indication, by 2016 the whole country may be ready to elect a candidate like Warren. That will be a big left turn, and the North would be following a trend started by the South. Like Vallejo in Santiago and Sawant in Seattle, the new leadership of the left is coming from the middle-class and not just the working class. Having seen their middle-class dreams turn into nightmare because of excesses by big banks and large corporations, the young and educated are turning to the left. The “1 percent versus 99 percent” slogan has begun to make an impact! Note: This piece first appeared on the Author's blog space "BRICStreet" on The Hindu's websites. It is reproduced here on this blog with the author's consent. However, the photographs used in this post didn't appear in the original blog-post on The Hindu's website. Shobhan Saxena is a senior journalist based in São Paulo, Brazil. Currently, he is the South America correspondent for The Hindu. Glancing through a couple of articles on your blog, I perceived that your strategy of imparting this valuable content among us is appreciable. I am sure this might turn out to be pertinent to a majority of seeker's heed. Keep up with this admirable work.